Also, progress on the IOS version is coming along steadily. I mean how do i upload a block .png File. Is this only for block editing or can you edit custom mobs as well? It's for making full forge mods. You can use it to make custom blocks as well as entities. Does that answer your question? Where did you get that misinformation? This is just for the block models format introduce in Minecraft 1.8. It's for making models for Resource Packs. It has absolutely nothing to do with Forge (since Forge isn't up to date with 1.8), nor can it make entities of any kind. I hope that actually answers your question, billytuck557. How come i cant find out how to upload a block .png file? *facepalm* Sorry, I got this mixed up with MCreator, sorry 'Bout that. Location: Down the rabbit hole! 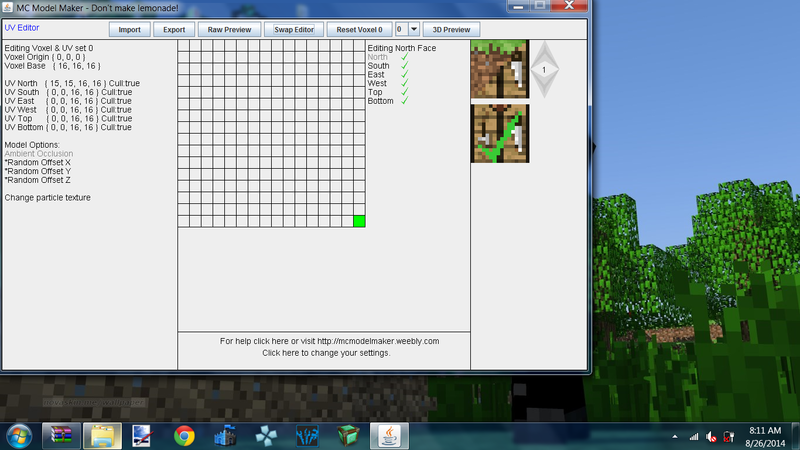 While you are on the UV Editor, click the half grass - half crafting table icon. Follow the pop ups, and you are done. Whats a Texture Index? Witch one do i chose? Choose one that you have not selected before, unless you want to replace one. I will also post a quick update to make it use names, not indexes. Is there any video that can help me? Is your image 16x16 pixels? If not, that is why. Also, make sure that you change to the right index with the selector (The two arrows). If you still can't figure it out, I will make a video. I'd like to know if and how it's possible to make solid blocks non-solid to prevent problems like this. Do you think you will add a way to export to .obj or another 3d modeling file? 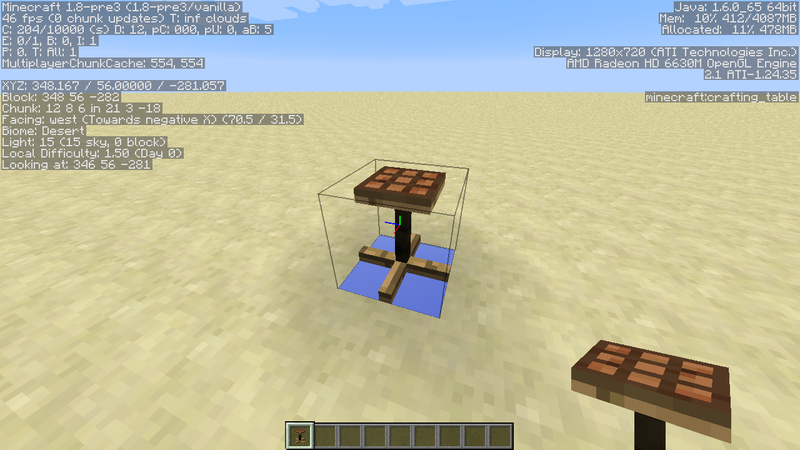 Not a bug, it's because the block below it thinks crafting tables are solid blocks and so it turns its top face invisible, thinking it's hidden. Basically it's that cullface setting, on the normal block instead of the crafting table. Unfortunately, turning it off would make every sandstone block in the world render 6 faces, which would likely drop the game to almost 0fps. Well, yeah you are right, but I do believe Mojang were going to do something about this. They probably hid some kind of 'renderpass' value in model files, kinda how they hid 'interpolate' for texture animation files. Actually, I already made the video with the explanation, but no voice (because I have no microphone), I just have to edit the representation of the shots and upload the video. 32x32 textures are not supported currently. An index is a number that represents where that texture is on a list. I think you have a nice program going on here, but i can't figure out how to make the actual 3d models. I can get the files open and those things, but i have no clue how to do the models. A video tutorial should be released soon by Cris_Art_32 or reedmanisback. Can you send me your resource pack? Also, please contact me at [email protected], since it is unrelated to this thread. Hmmm. I will post an update soon. I haven't heard of a way to fix this, but I hope they do add a way soon. Quote from Hori873How can I make it work with 32x32 textures? Sadly, you can't. I will add this feature in the final release though.